Invest in unmatched speed, reliability and compatibility. Ideal storage solution for pro photographers. 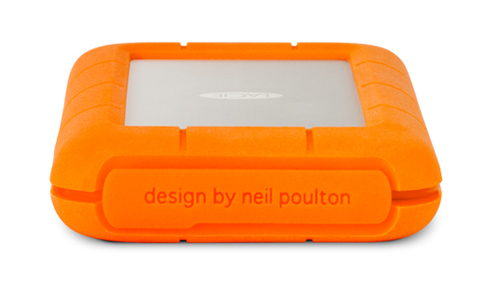 The LaCie Rugged Drive with USB3.0 and Thunderbolt (2TB) interfaces is durable, rugged and perfect for use on location or in tough conditions. Don't let your project get derailed by external drive/computer incompatibility. With both USB 3.0 and Thunderbolt interfaces, the LaCie Rugged is a perfect match for your Mac® and PC. And because USB 3.0 is backwards compatible, you can connect it to any standard computer on the planet. 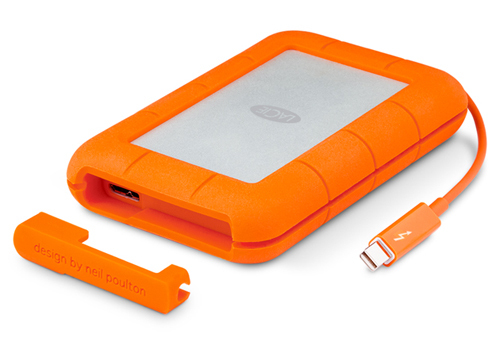 The LaCie Rugged is also fully bus-powered through the included USB 3.0 and Thunderbolt cables. Its portability and interfaces make it the must-have sidekick to a new Mac or Ultrabook™. Get lightning-fast transfer speeds on Mac and PC thanks to the USB 3.0 and Thunderbolt interfaces. The HDD version performs up to 110MB/s, a 35% improvement over FireWire 800. Back up and transfer mountains of data in a fraction of the time. Enjoy noticeably more responsive photo library browsing. Protecting your data is vital to meeting your deadline, and disaster can strike at any moment. That's why the LaCie Rugged is MIL-compliant for superior data protection from accidental drops up to 1.2 meters (4 feet). Whether it falls off your desk or out of the pocket of your safari jacket, you're confident that your data is still accessible. The SSD version goes a step further for the ultimate in resilience against vibration and shock. Both versions are tough enough to be shipped for reliable delivery to clients or partners. Included software even protects your files from prying eyes with AES 256-bit encryption. This hard drive has a rubber port cover to ensure your hard drive is extra dustproof and splash resistant when not in use. Computer with a Thunderbolt, USB 3.0, or USB 2.0 port. For Thunderbolt: Latest version of Windows 7, Windows 8 (click here for Windows drivers information) / Mac OS X 10.6, 10.7, 10.8, or greater. For USB 3.0: Latest version of Windows XP, Windows Vista, Windows 7, Windows 8 / Mac OS X 10.5 (Intel only), 10.6, 10.7, 10.8, or greater. A reliable, dual-drive personal storage that plugs into your home network.